Winter brings rain, wind and snow and it is important that you prepare extra bedding for your guinea pig’s hutch before it gets too cold. Keeping the hutch sheltered from the elements is also important for the wellbeing of your furry friend. Don’t wait until it is too late and the snow is falling before you are ready with everything your need. Guinea pigs are tough little creatures and will normally cope quite well with colder weather conditions as long as they can keep themselves warm. Extra bedding will help them to do this. Straw is the most common choice of bedding in guinea pig hutches and makes a better bedding than hay because guinea pigs do not eat straw so there is less chance of them eating their own faeces. You can also use shredded paper or other paper based bedding; these provide a comfy bed but can become damp from urine more quickly than straw. If you want to add some extra warm during the colder nights you can buy microwavable heat pads from pet stores and these can provide warmth for up to 10 hours. Once you have heated the pad up place it under a blanket or towel in the base of the Guinea Pigs sleeping area. If there is a more sheltered area of your garden them move your guinea pig’s hutch there. An even better choice is inside a shed or out-building. Hutch covers will protect from the wind and rain too. There are many different covers available, some fit all hutches and some are specifically designed for certain hutches. These made to measure covers usually provide a better fit than general covers. If you cannot find a cover which fits your hutch, how about using a tarpaulin instead. Make sure it is securely attached to the hutch and that there are no gaps which draughts could get through. Should I Keep My Guinea Pig Inside? 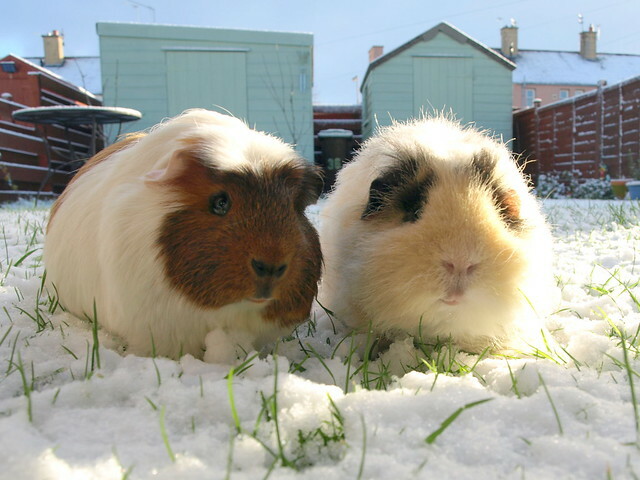 Most adult guinea pigs will be perfectly ok kept outside, even during the winter. For young guinea pigs or those that are older or have been unwell, bringing them inside can be a good idea. You should buy an indoor cage for them as this is easier to clean and will allow the air to circulate. Place the cage in a nice quiet area of the house which is kept at a constant warm temperature. As someone who has dealt with pets in his profession for a number of years, Percy Jackson now shares his advice and knowledge on his own website which he has called Percy’s Pets. You can find top tips for all types of pets from dogs and cats to birds and reptiles.